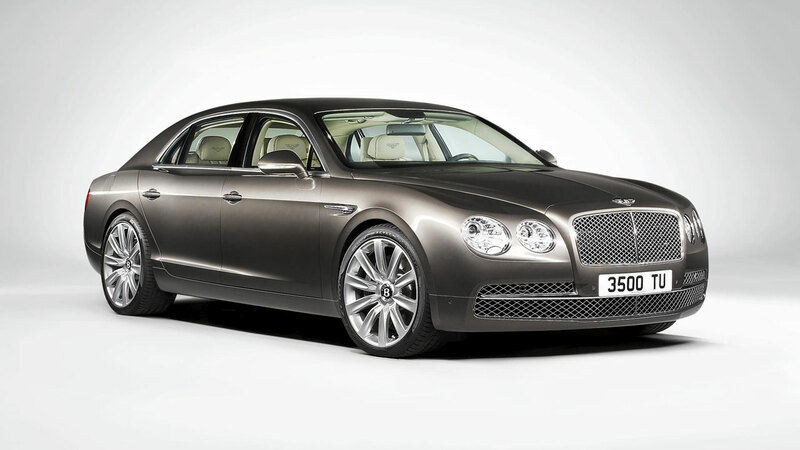 Bentley establishes a new luxury performance sedan benchmark with the launch of the new Flying Spur. With its unrivalled blend of effortless driveability, exquisite luxury and craftsmanship, sculpted design and state-of-the-art technology, the new Flying Spur takes the worldwide success of its iconic predecessor further. 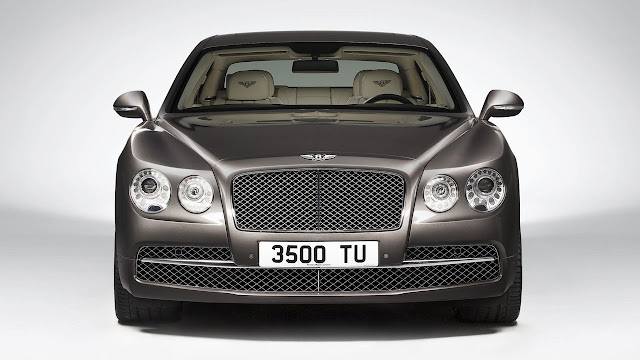 Bentley’s most powerful four-door model ever maked its global debut at the 2013 Geneva Motor Show. Driver and passengers alike interface with the car and the outside world through touch-screen infotainment, mobile connectivity including Wi-Fi, a Rear Seat Entertainment suite and a new hand-held Touch Screen Remote which allows rear-cabin occupants to control an extensive range of features from the comfort of their seat. An eight-channel, eight-speaker audio system with Balanced Mode Radiators provides high quality sound clarity, with the 1100W Naim® for Bentley premium system available as an option. At the front of the car, a more upright chrome grille sits between the pairs of jewel-like LED headlamps. Emphasising the lower, wider stance, the outer lamps are the larger of the two. Beneath the front grille, the lower intake is now full width with no vertical divisions, but instead with a chromed horizontal accent that completes the dramatic face of the new Flying Spur. At the rear, a longer and lower boot lid lends a more swept appearance to the side profile. 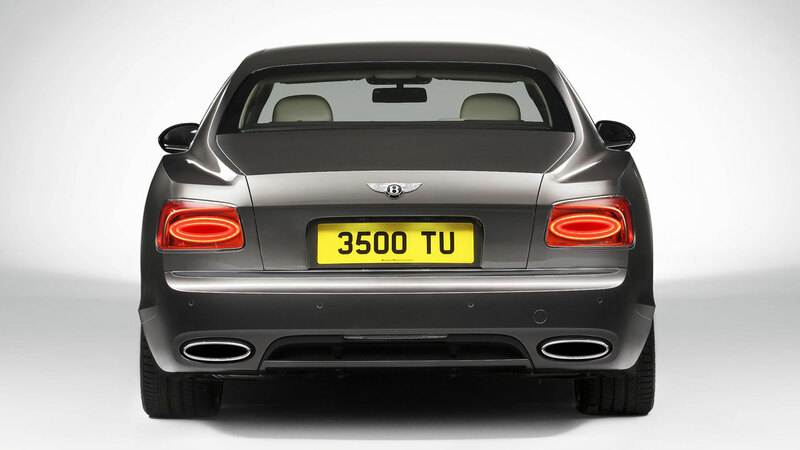 Horizontal single ellipse LED tail lamps combine with a new interpretation of the Bentley “Horse Shoe” feature line, now running the full width of the car and encapsulating a graceful concave section. Beneath the elegant skin of the new Flying Spur, a wide range of materials is applied in an intelligent and efficient manner. Designed to improve overall body stiffness and refinement whilst meeting stringent crash performance targets and pedestrian protection legislation, the new body structure includes reinforcement to the B-posts, sills and front crossmembers together with deformable components in the floorpan for optimal load transfer. A deployable bonnet that includes both new reinforcement panels and deformation elements helps to improve pedestrian impact performance. The bonnet and front fenders are constructed in aluminium, with the fenders shaped using the aerospace-industry superforming technique, employing compressed air to shape heated sheets of alloy into the required form at over 500°C. Exceptionally clean lines with sharp radii and lighter-weight components are the result, giving the new Flying Spur an unmistakeably Bentley front end with extremely taut shut lines. The new door structures are completely redesigned with fewer individual parts for improved quality and refinement. An optimisation of the doors realised through efficient use of materials contributes to much improved door kinematics and feel. Meanwhile, further weight savings are achieved through the crafting of the bootlid in a polymer composite material that also integrates the main antennae for the car’s electronic systems. 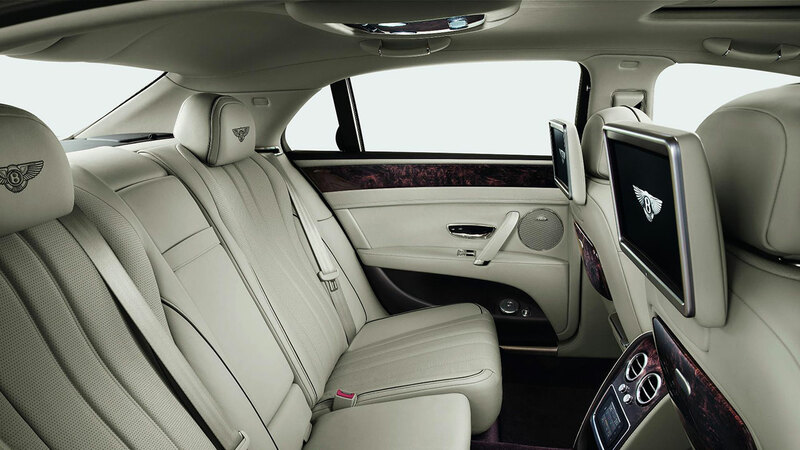 The interior designers, together with the craftsmen and women of Bentley’s renowned woodshop, have applied the finest wood veneers to finish the cabin of the new Flying Spur. Utilising almost ten square metres of sustainably sourced natural wood per car, the Flying Spur features book-matched and mirror-polished veneer to the fascia panels, consoles, waistrails and picnic tables. To enhance the “wrap-around” feel of the forward cabin, the veneer of the dashboard meets that of the doors in a perfectly aligned curve, giving the impression of an unbroken arc of wood around the interior. Crafted entirely by hand, cured for 72 hours and clear-lacquered to enhance the natural beauty of the wood, a range of seven sophisticated veneers is available (two as standard - burr walnut or dark fiddleback eucalyptus). To complete the luxurious and opulent nature of the cabin, the roof lining and pillars are also trimmed in natural leather. Layers of supple foam are applied to all tactile surfaces beneath the hide, harmonising the touch and feel of all areas of the cabin. Electrically-operated rear side blinds, fitted as standard, permit privacy for rear-seat passengers if desired. Customers may also specify an optional glass sunroof at no additional cost. Behind the central rear armrest, a nine-litre bottle cooler can be specified to keep drinks perfectly chilled. The interior designers also focused on improving interior stowage around the cabin, whilst including new electronic technologies discretely throughout the interior. 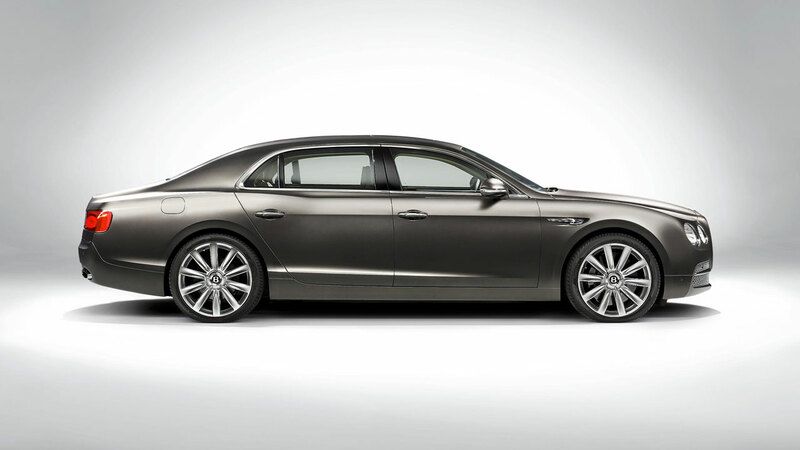 Customers wishing to work on the move may order the new Flying Spur with the new Multi-Media Specification. Central to this is the Bentley Connectivity Unit (BCU) which allows portable devices, laptops and tablet computers to connect to the internet through the car’s own Wi-Fi hotspot with an active SIM and includes 64 GB of internal storage capacity. Two 10” LCD screens are installed to the backs of the front seats, while top-loading multimedia players sit in pockets fitted beneath, allowing the user to load and enjoy video, photo and music content from DVDs, SD cards, USB devices including iPods and iPads, and HDMI devices. Achieving class-leading comfort and refinement was a priority during the development of the new Flying Spur and the acoustic isolation of the cabin from external noise inputs was a particular focus. Bentley’s development and use of lightweight acoustic underfloor panels to minimise road noise continues, with aerodynamically optimised insulating sections applied to almost the entire underfloor of the car. Side glazing and both front and rear screens are made in acoustic glass, featuring a specially developed interlayer that reduces noise transmission. An improved sealing system around the side glazing now features two individual sealing points to reduce wind noise to a minimum regardless of road speed. The redesigned doors are also fitted with additional insulation to the outer skin, reducing noise diffusion in to the cabin. Enlarged rear mufflers reduce exhaust noise by 12 dB at 3000 rev/min for enhanced passenger comfort. As Bentley’s most powerful engine, the 6.0-litre, twin turbocharged, 48-valve W12 is the natural choice to power the fastest ever Bentley four-door. Now delivering 625 PS (616 bhp) at 6,000 rev/min and a staggering 800 Nm (580 lb ft) of torque from only 2000 rev/min, the W12 has recently undergone a complete engine management system upgrade to the latest Bosch ME17 interface. Improved torque management, turbocharger control, driveability and emissions performance all result from the adoption and optimisation of the new system, with a resulting improvement in low speed responsiveness. Coupled to the W12 is the very latest eight-speed, quick-shift automatic transmission from ZF. All Bentley models now feature this state-of-the-art gearbox. Delivering seamless and imperceptible shifts in under 200 milliseconds, the gearbox is not only designed to handle the mighty torque output of the W12 but also to ensure smooth and refined delivery of power to the wheels. An optimised set of gear ratios keeps the engine in its most efficient operating range under light loads and when cruising, contributing in an overall improvement in fuel consumption and CO2 emissions of more than 13 per cent over the outgoing model. The new Flying Spur delivers a combined cycle fuel economy of 19.2 mpg (14.7 litres/100 km), and CO2 emissions of 343 g/km – impressive figures for a 12-cylinder ultra-luxury, high performance sedan. With outstanding ride comfort of vital importance, the independent computer-controlled air suspension of the new Flying Spur is redesigned to maximise impact absorption and isolation. Compared to the outgoing model, suspension spring rates are softened front and rear by 10 per cent and 13 per cent respectively, for improved ride comfort in the normal operating region. The rate of stiffness increase during harder cornering has been increased for improved control of heave, pitch and roll. Anti-roll bars are softened by 13 per cent and 15 per cent to improve single wheel impact absorption. Suspension lever bushes all-round are softened by at least 25 per cent for reduced road surface-induced noise and vibration. Working with the new springs, a damper hydraulic specification has been developed to maximise ride comfort. Working with a revised damper electronic control (CDC) strategy, this enables exceptional low speed ride performance while damping force increases significantly with speed, providing the optimum balance between body control and stability at all speeds. A four-position suspension control, with a widened range of settings, allows drivers to choose the level of damping to suit their preference. The power steering system provides a comfort-orientated balance whilst maintaining optimum steering feel and precision throughout the speed range. A new specification of steering gear, together with a new calibration of the speed-sensitive system that regulates hydraulic fluid flow, provides variable assistance depending on vehicle speed. The new system delivers both high levels of isolation from surface deformations whilst ensuring driver confidence through the combination of accurate steering precision and a measured increase in steering effort when cornering. As the new Flying Spur approaches its 200 mph (322 km/h) top speed, the ride height is automatically lowered via the air suspension system in order to compensate for aerodynamic forces. This helps not only to improve vehicle stability by optimising aerodynamic balance along the car, but also reduces drag, with benefits both to top speed and CO2 output. The new car has a two-stage lowering strategy, firstly lowering by 5 mm at the front and 10 mm at the rear at 121 mph (195 km/h) and then by a further 8 mm and 13 mm respectively at 149 mph (240 km/h). The multiple-mode Electronic Stability Control (ESC) system is recalibrated to work in combination with the new chassis specification. The system is calibrated to ensure that the enthusiastic driver is not hindered by stability interventions and, where appropriate through the selection of the ESC Dynamic Mode, the driver can further explore the handling limits of the vehicle whilst still maintaining appropriate levels of stability control. 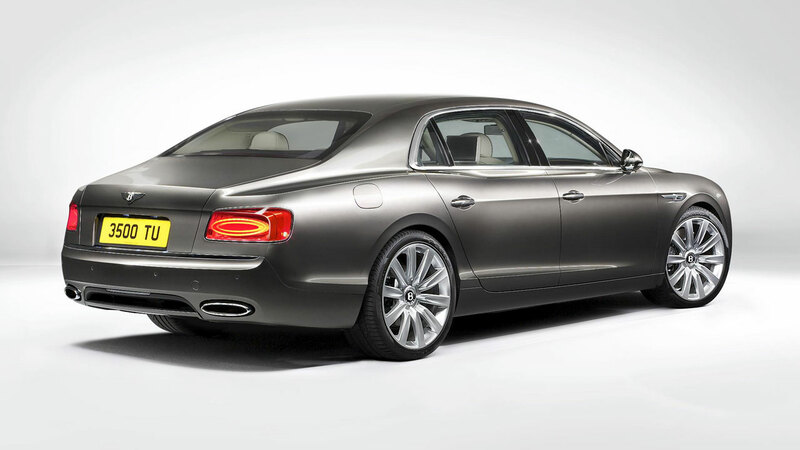 As with the entire Bentley range, the new Flying Spur is built to individual customers’ exacting specifications. A range of seventeen standard exterior paint colours includes Dark Cashmere, a sophisticated and contemporary addition to the Bentley palette. The extended paint range of over 100 colours is joined by Damson, a rich hue inspired by the extremely rare purple diamond, and one that is complemented by an optional matching hide colour.